Lorenzo Fabbri, Board Member of the ICC and Assistant Professor of French and Italian at the UoM invites you to BORDERS (OF THE HUMAN). 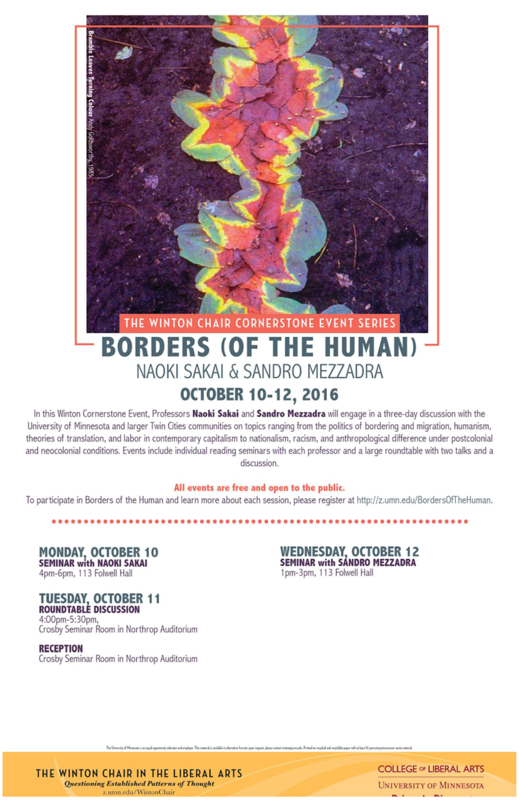 Please join us from Monday, October 10, to Wednesday, October 12, for Borders (of the Human): NAOKI SAKAI and SANDRO MEZZADRA. Professors Sakai and Mezzadra will engage in a three-day discussion with the University of Minnesota and larger Twin Cities communities on topics ranging from the politics of bordering and migration, humanism, theories of translation and labor in contemporary capitalism to nationalism, racism, and anthropological difference under postcolonial and neocolonial conditions. Events include individual reading seminars with each professor and a large roundtable with two talks and a discussion. All events are free and open to the public. To participate in these events and to learn more about each session, please visit http://z.umn.edu/BordersCornerstone. Event information and schedule are included in the flyer below, with biographies of these Cornerstone Visitors below. Please circulate this announcement to interested students, colleagues, lists, and local community members and organizations. Help us promote this Winton Cornerstone Event online by indicating your attendance and sharing this event on Facebook at http://z.umn.edu/BordersCornerstoneFB.